Aaron Scott wins the St Valentines 30k. Aaron Scott equalled his own course record at the Stamford Striders St Valentine’s 30k race on Sunday (February 15). 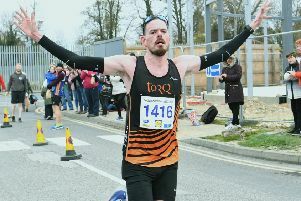 The Notts AC runner from Stamford clocked 1:37:52 to complete the tough 18.6-mile route in the same time he recorded in 2014. Scott took advantage of bright, sunny conditions to lead the 617 runners out from Stamford, through Little Casterton, Tolethorpe, Ryhall, Careby, Pickworth, Great Casterton and then back to Stamford. Second-placed Stuart Spencer was just four seconds behind his clubmate with Neil Renault, who had made the trip down from Edinburgh AC, third in 1:41:57. Nene Valley Harrier Philippa Taylor was first lady home in 2:00:27, followed by Hannah Oldroyd (UK Netrunner) in 2:02:11 and Nene Valley Harrier Tracy McCartney (2:04:03). James Skinner was 22nd overall and first home out of 26 Stamford Striders, knocking six minutes off his 2014 time to finish in 1:58:03, ahead of clubmates Jim Morris (1:58:33) and Richard Skidmore (2:09:39). Vicky Old was first lady Stamford Strider home in 2:20:56 followed by Julie Parker (2:32:22) and Caroline Gasper (2:41:39). Full Striders results: James Skinner (1:58:03); Jim Morris (1:58:33); Richard Skidmore (2:09:39); Mark Popple (2:10:34); Richard Rae (2:15:24); Colin Brackley (2:16:09); David Aust (2:18:58); David Old (2:20:56); Victoria Old (2:20:56); Nicolas Bertrand (2:21:47); Stuart Hodgkinson (2:23:23); William Blackmore (2:31:43); Julie Parker (2:32:22); Andrew Wade (2:35:30); Noel Webb (2:41:10); Caroline Gasper (2:41:39); Nicola Patterson (2:43:59); Kirsty Whatmore (2:49:40); Libby Morley (2:51:18); Claire Jaggard (2:53:43); Simon Marvel (2:55:05); Stephen Moore (2:57:24); Caroline Robertson (3:04:43); Olivia Achurch (3:11:30); Emma Sowden (3:14:46) and Michelle Webster (3:21:53).